Readers who had seen my post on Public services are different may remember that somebody had been fraudulently buying up phone contracts under my name. 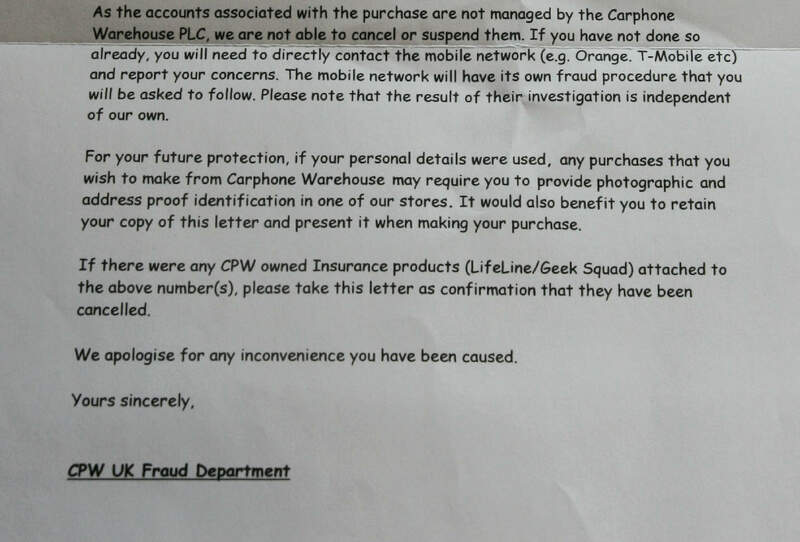 Last Friday I received this letter from the Carphone Warhouse UK Fraud Department. Apart from the clumsy, evasive wording of the letter, what really hit me was its font. Comic Sans should have died of ridicule years ago. There’s even a website called bancomicsans.com. Actually, Comic Sans has its place. Its rather childlike appearance makes it quite appropriate for use in primary schools or nurseries, for example. But what on earth is a fraud department of a major company doing using it? If nothing else this shows that this department is disconnected from the rest of the company, which no doubt has strict house style rules. This is not a bad thing of itself. The evasive and non-empathetic wording also shows that no communications professional has been anywhere near it. As for the outcome, this letter says to me that my case has been filed in the closed category, with a bar being placed on anybody quoting my name an address buying anything from Carphone Warehouse. I’m not complaining; I have no plans to buy anything from Carphone Warehouse after a couple of rather bad experience with them a few years ago, including another fraud. But I’m still amazed how so many people are fontblind.